it's perfect. congrats. this really is inspirational, as was your whole process. thanks for sharing. Truly beautiful, rich, and inspiring. The photos of the clothesline and one against the yellow building would be lovely framed. I can't get over how amazing this looks! There's so much texture and little details everywhere. Simply wonderful! I LOVE this quilt. I am not sure what I like best - the colors or the random look of the patches. It is a winner! I love love love this quilt. Really amazing work. So beautiful. this is really wonderful. i've enjoyed watching your process. This is the most wonderful quilt I have ever seen! I love every detail! I am so inspired by the idea of a vintage inspired "work" quilt. Great job! It's like a Miro painting translated through quilting. I love that it is grounded in a basic nine patch, but then there's all those wonderful patches dancing over it. Of all of the beautiful things you have created, this may be my favorite. Your notion of patches and being mended- and age and layers only adds to the beauty. It's wonderful, Victoria. I'm so glad to hear how happy you feel about it yourself. Interestingly, my veriword is "asking". I love it! awesome!!!! you did a beautiful really beautiful job! i love it! I love all the little details... and the intention shows. Congrats on such an amazing creation - so inspiring! WOW, I really gasped when I saw this, it is soooo stunning and so incredibly rich and full of personality and meaning and life. Of everything you mentioned in this quilt journey - I really can see you got there, I hope you feel that too. it's gorgeous and so inspirational! I love all the layers created by the fabric and stitches. The colors are so rich. perfect! This is even better in it's entirety. I think you are on a very interesting and adventurous road. I am looking forward to following to see where it takes you. I adore this quilt. I love the colors, the stitching, the randomness that isn't TOO random...it has a coherent look to it. I think you need to enter this quilt in an art show - Houston or something. It is absolutely fabulous! Oh Victoria! That is so raw and beautiful. It seems positively perfect, in balance and in construction and detail. And the photo on the building? Almost as beautiful as the quilt. 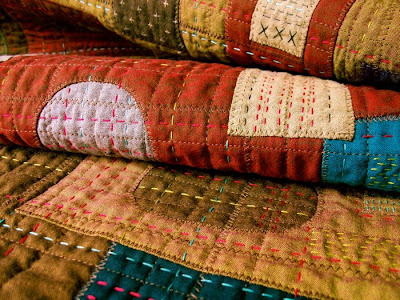 I love the ordered chaos, the rich colours, the hand stitching, running through it. It has character of its own - it is stylish and cute, balanced and unordered, incorporating some brights and some muted colours. You are in the right direction for sure! I love this quilt, Vic!...every patch, every stitch, every everything! And I love how it looks with that green yard (?) & picket fence & that barn (?). Is this your home because I love the glimpse of it! This is lovely - reminds me of 1950's furnishing fabrics circa Festival of Britain - and yet still easily identifiable as your work! This is a gorgeous finished piece Victoria. And I am blown away by the gorgeous photos of it in the wind but especially of the one outside on the house. WOW! Victoria, This quilt is just phenomenal! I love every stitch and every piece of fabric. Just a wonderful job! I think your quilt is great. I love the hand stitching. The colors are wonderful. Great job. These fabrics work so well with the stitching. Beautiful work. This piece falls into my covetous "wish it were mine" category! unbelieveable! you slay me. this is absolutely stunning. bravo! Absolutely amazing! 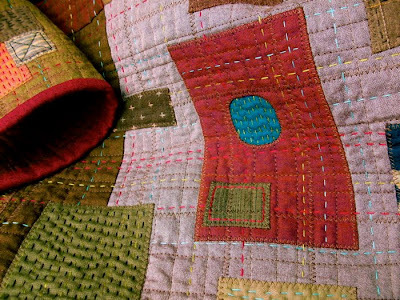 I love the rich colors and textures in this quilt. Your work is stunning and that photo of the quilt on the gold building is gorgeous! Very beautiful. I like the photo of the quilt on the building as well. Your quilt is just beautiful! It's a real treat for the eyes. The quilt is perfect, Victoria, and it has been interesting to follow your process. I'm looking forward to follow you down your new path. Love the quilt....and that photo against the yellow-gold wall! Just wonderful. I see so much heart, whimsy, care...and even affection in your work...I can imagine this one...handed down for generations...Loved more and more with every passing year. Thanks so much for sharing...The muse is singing....! Love the piece, Victoria, and I enjoyed following the process. Your stitching is incredible! Far out Vic! I knew this would turn out awesome but this has even exceeded my expectations! You are brilliant and I LOVE IT!!!! The photo of it on the side of that building is magic. Did you climb all the way up there to hang it? ;) Oh I can just see the looks on your neighbour's faces! Haha! Congratulations on such a beautiful piece! Your quilt journey is proving enlightening! what a wonderful array of colours and textures. Quite stunning! well done. this is a stunning piece Victoria and I was also almost distracted by the scenes behind it, your beautiful fields and outbuilding. Lovely! I love all the detail, and enjoyed reading your post. :) I came here from your Flickr photo link. I covet this piece. Sorry. But that's the truth of the matter. Thanks so much everyone! And Thanks to our trusty old cedar shed, (those skilled Amish men know how to build 'em!) for providing the perfect backdrop! 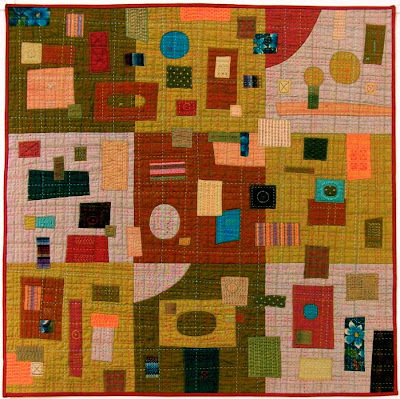 This quilt remains me of paintings by Paul Klee. Absolutely gorgeous! I’m without words! I can’t find a word to describe what I see, all superlatives come to mind, but they don’t seem to be good enough! 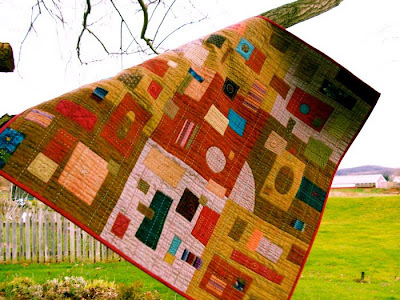 Thanks for being a wonderful inspiration and you’re definitely on the right quilting track!! I just found your post via "One Red Robin". Your quilt is amazing. "each patch of fabric and every stitch was placed with a lot of thought and intention"....You Can Tell! Your composition is amazing. Now I am going to go and check out all your older work. Lovely! Intrigued by the(what I will call) embellished stab and stitch. Thank you for sharing this. I heart this quilt to the moon and back! Every fabric choice, every quilting stitch, all of it! Can I give you a standing ovation? Lovely colour scheme. Kind of reminds me of those red-green colourblindness tests ;)For some reason the abstract shapes make me think of Klimt (one of my favourite artists). I am blown away by your handwork. This is an incredible work!! This quilt is unbelievably wonderful. lovely, lovely, lovely! look forward to seeing where this path takes you! Just adding to the high praise - this is just beautiful. I am loving where your art is taking you. Wonderful, wonderful and inspiring! I'm late to the party Victoria (haven't had internet access for FIFTEEN DAYS!!! lol); but wanted to tell you how much I love this quilt. It's absolutely stunning. oh victoria, you must be so pleased. this is stunning...such movement and joy in this quilt. are you selling this one? Just spectacular. I love this quilt! Love it! Hope you had a Merry Christmas. Stunning quilt. I adore the variety of stitches you used. 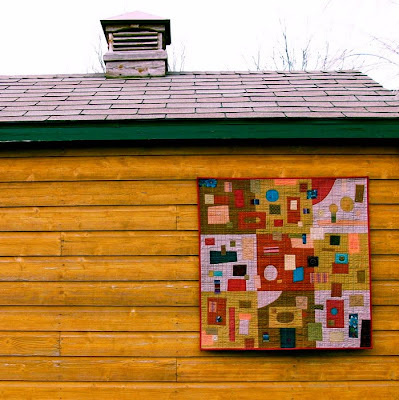 I just happened across your blog, read this story about your quilt and I have to tell you that I enjoyed reading this and can appreciate your thoughts and desire to create such a quilt. It is a beauty and I am glad that you enjoyed the process and shared with us. Such a joyful and fulfilling project. Thank you! Thanks for sharing this. I am in love with your quilt and your style of art. I enjoy seeing the tiny details in your stitching and the running stitches when you quilt. Beautiful. Oh, yes, I remember now. I googled 'wonky star tutorial' and it took me to you! !